Food Genius is a new online tool that turns restaurant menu items into infographics. The app helps restaurant-goers choose the right eatery by allowing them to search for restaurants by the food they'd like to eat. 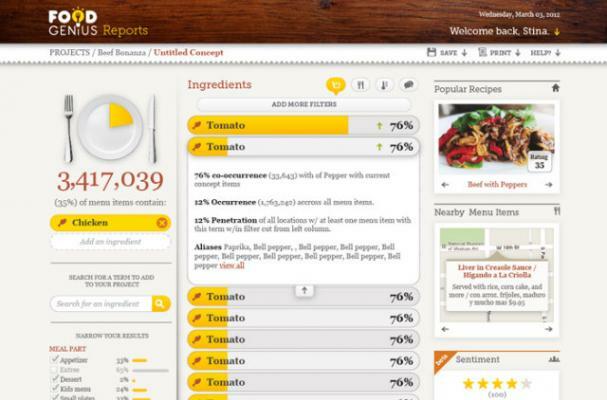 The app has indexed 14,00 ingredients from different restaurant databases. Food Genius uses this information to tell users how much beef is used in restaurants all over America, the average price for specific dishes, or how popular certain food pairings are. Not only does this information help foodies looking for the right restaurants, it also helps chefs and restaurant owners figure out how unique their dishes are and how competitive their prices are through instant market analysis. "Food Genius offers a web based data platform, plus tools and technology for Food Industry Professionals," the app's official website reads. "Discover ingredient-level restaurant menu data to develop actionable insight and drive business decisions. Whether you are a corporate research chef, food product developer, or food industry consultant, the data, insight and technology provided by Food Genius is key to gaining a competitive advantage." To learn more about Food Genius, check out the video below!